The title of this column is becoming increasingly ironic as I struggle to meet the demands of writing and running a business, so my apologies for the infrequent posts recently. Our seven fans are probably pissed! Ever since high school when I would double back home after my parents went to work back on trade deadline day, I have not missed a single TSN trade extravaganza. This year, however, promises to be perhaps the most interesting installment because the Toronto Maple Leafs are in full sell-off mode. While they’ve already been in the thick of the action, with three trades already, it appears that they are set to make at least a half-dozen more. The Dion Phaneuf trade pales only in comparison to the David Clarkson trade. How did the Leafs convince a team with almost no shot at the playoffs to take on the remaining years of a heavily declining player? I assume some magic was involved. They did make sure that Phaneuf rarely hit the ice with anyone other than Jake Gardiner, who is the Leafs’ best possession driver and all-round best defenseman. With Gardiner, Phaneuf was a 53% CF% player and without him just 47%. That’s a significant drop off. Sure, the players the Leafs got back weren’t anything special, but they save money long-term, get out of a bad deal, acquire assets they can flip later, subtract from their 50 contract limit and even add a 2nd round pick and a decent prospect. Matthias was good for the Canucks last year, but not so good for the Leafs. He was a depth player on a bad team, and even though he wasn’t bad, I was still surprised the Leafs could get a player and a pick for him. Sure, the player is a “C” prospect and the pick is in the fourth round, but both have far more value to the Leafs of the future than Matthias does. Plus, the cap savings will allow the Leafs to make trades that take on salary in exchange for more assets. Again, another incredible trade for Toronto. This trade is probably the most incredible of all. To get two 2nd round picks and save money (see above) is simply insane considering the best these players are is bottom-of-the-lineup depth. In a move as impressive as it is smart, the Leafs took deferred payments in order to get higher picks. So in exchange for some objectively bad players and some patience, they now have an extra 2nd rounder in 2017 and 2018. 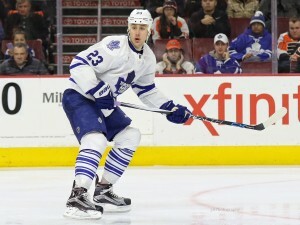 Much to my chagrin, some Kadri rumours are making the rounds this morning. Some are saying the Leafs are interested in Kevin Shattenkirk. I wrote that the Leafs should be interested in Shattenkirk just a couple of weeks ago, and I’d really like to see the Leafs get him. However, the cost of a young, high-ceiling player like Kadri is just too much to pay. This would be a horrible trade for the Leafs. As they get younger and more skilled, the fans of the team are going to appreciate Kadri’s hard-nosed, two-way game and game-breaking skill much more than they do now. The Leafs will live to regret it if they make this move. I don’t even want to try to predict. The unusual thing about this Leafs management group is that none of their moves are ever rumored in the media before they happen, so whatever they do next will come as a total surprise. I mean, sure, it’s clear they’re going to trade P.A Parenteau, but knowing the Leafs, they’ll package him with two minor prospects, take on $8 million dollars and somehow get a first-round pick out of it for 2024. The bottom line is that its going to be fun to watch, and for the first time ever it seems like the Leafs actually have some of the best management in the league.